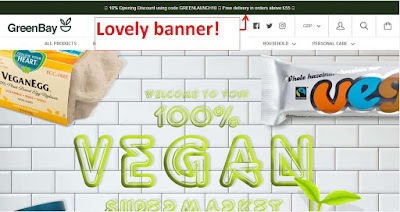 The Vegan Magpie: Greenbay supermarket offer! Hello. In 2016 a new shop opened in London- Greenbay supermarket. This is an entire vegan shop for your grocery needs. They have now launched an online shop-yay!- and for a limited time they have an offer running. Just go here: https://www.greenbaysupermarket.co.uk/ and when you checkout use the code GREENLAUNCH10 to get 10% off your order. They also have free P&P on orders over £55. They have a vast array of wonderful products, from treats to store cupboard items. So this may be a great way to stock up on harder to find items (with a little deal thrown in!). I can't find an end date, but all the time the banner (shown below) is at the top of their site it should be valid. As always, please check you're happy with the price before you buy!